First of all, thank you so much to everyone who shared encouraging words and sent me happy healing vibes – much, much appreciated. Last night I had my first lesson following the show. Hemie was a good boy – very willing and sweet. Laurie instructed me to engage him more actively sooner after I get on (normally I spend several minutes just cruising around, getting myself all situated). We also worked on keeping his hips to the right when tracking right, since he tends to bulge left. I focused a lot on keeping my lower leg more engaged, and I think its improving. We also worked on my recuperation after fences – I tend to take too long to sit up and actively ride after landing. After the lesson, I briefly chatted with Laurie about the show, to see how her thoughts had settled a few days afterwards. 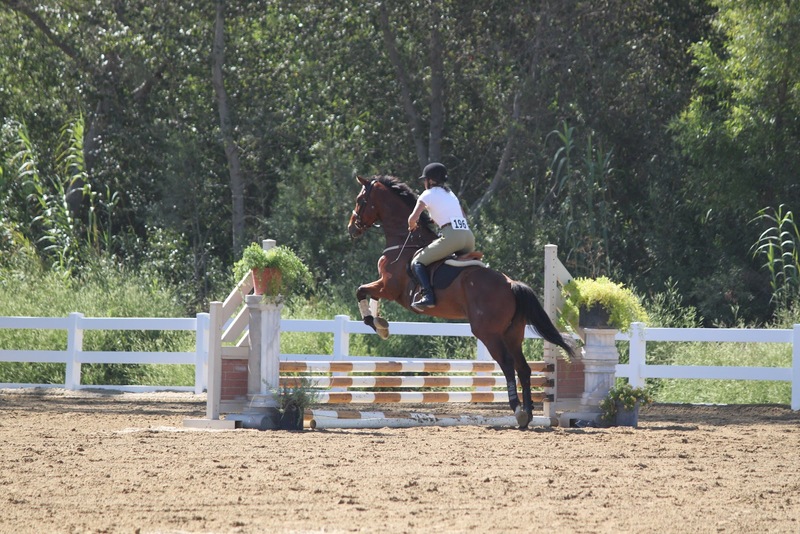 I was surprised to find out that she did not think Hemie’s freak out was due to jumping fences he hadn’t inspected first (at home we allowed him to circle and get a big ‘ol eyeful of jumps before asking him to go over). She thought he just got overwhelmed by the whole situation – lots of people, lots of horses, feeling “on the spot” perhaps. She said that the real issue was not his squiggly fences, but the stalling out and getting stuck in between them. Most importantly, she confirmed that the base issue is his confidence level. She suggested we go on more trail rides (something I had already thought of, but glad she suggested as well), and we have a schooling planned for this Sunday at the Meadows. More exposure and confidently getting him through these situations will help him. 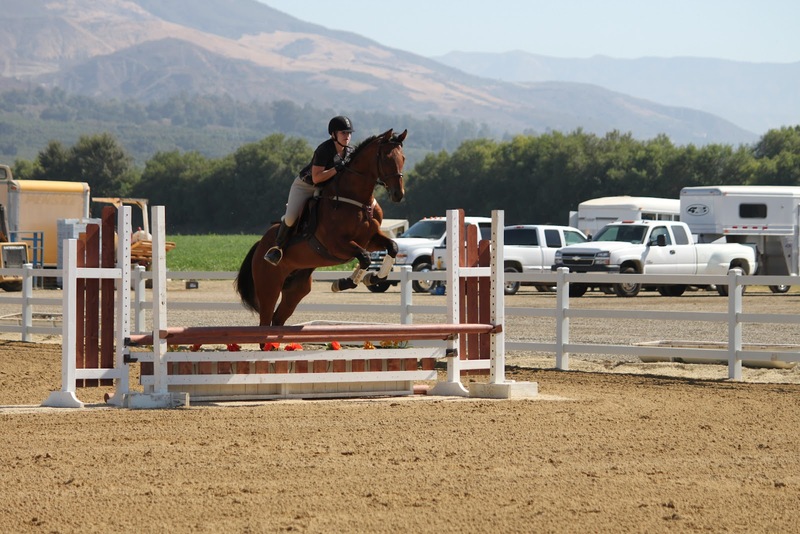 Meanwhile, I’m gonna be doing homework on confidence-building in OTTBs – other suggestions, anyone? Here’s some more photos from Saturday. Just look at the backdrop – I love Ventura County. Myself riding in the hunter ring. Laurie riding in the jumper ring. Thanks to J.D. for the photos (and thanks to hubbie for yesterday’s photos)!